This book comprises several motivations taught by Lama Zopa Rinpoche called Bodhicitta Motivations For Life, intended for us to use first thing every morning to generate the mind of bodhicitta and dedicate our life to numberless sentient beings. The Bodhisattva Attitude is taken from the sutra teachings of the Buddha and is based on verses by the great bodhisattva Shantideva in his Guide to the Bodhisattva Way of Life. The verses are meant to be recited each morning to remind us of how we are going to dedicate our lives to others. We all understand the importance of motivation and attitude and how they affect the quality of our work and the result that can be achieved. Rinpoche particularly emphasizes the need for us to have a very clear direction and purpose for life. The real meaning of our lives is to bring both temporary and ultimate happiness to all sentient beings and to do this we need to achieve enlightenment. Enlightenment depends on first generating bodhicitta and training our minds in the bodhisattva attitude enables us to do that. 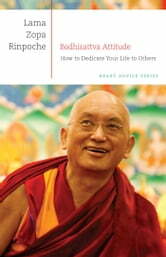 This book is drawn from Lama Zopa Rinpoche’s essential teachings given from 2008 onward. It is the first volume in LYWA’s Heart Advice Series. Please help us increase our efforts to spread the Dharma for the happiness and benefit of all beings. You can find out more about becoming a supporter of the Archive and see all we have to offer by visiting our website at http://www.LamaYeshe.com.